“Placemaking” activities like this one — defined as the “deliberate shaping of an environment to facilitate social interaction and improve a community’s quality of life” — have important benefits that last far beyond when the street barriers are packed up and traffic returns, according to a new report by Susan Silberberg and her research team at MIT. According to their report — Places in the Making: How Placemaking Builds Places and Communities — the actual process of placemaking can be even more important than the physical outcome. Open streets events, Park(ing) Day demonstrations, or a Better Block effort — these projects build social capital and empower citizens to drive change in their communities. And that can have a powerful impact long after the project’s completion. “The act of advocating for change, questioning regulations, finding funding, and mobilizing others to contribute their voices engages communities — and in engaging, leaves these communities better for it,” Silberberg writes. Rather than focusing solely on the physical outcome of a placemaking project — a park design, for example — Silberberg and her team say it’s important to recognize that these projects tend to be ongoing. Public spaces are never really “finished” anyway, they say, but rely on ongoing adaptation and maintenance from the community. Another case study examined the “Intersection Repair” project in Cleveland. This process began with a series of meetings and a design party, involving community leaders and neighborhood residents. One of the outcomes was the resign of Newark Alley, a dark, overgrown passage in the city’s working-class Stockyards Neighborhood. An elderly neighborhood resident remembered when the area was home to a stream and orchard. That memory inspired the final design, which is painted to look like a river. In this sense, placemaking projects offer a welcome contrast to the planning dynamics of previous decades, which were characterized by top-down mega-projects led by impenetrable bureaucracies. The newer approach to planning — of which placemaking is a part — is inherently more democratic, more immediate and smaller-scale. Good stuff, but Fargo is in North Dakota not Minnesota. May I suggest the following : “Fargo (ND) and nearby Moorhead (MN)” ? I also came across the blog post below. It has some links for bicycle resources in that area. Thanks for supplying a definition of “placemaking”. I’ve seen the term as an element of “urbanist jargon” with a relatively nebulous meaning. “You don’t have to move to live in a better neighborhood” is certainly a call to action. 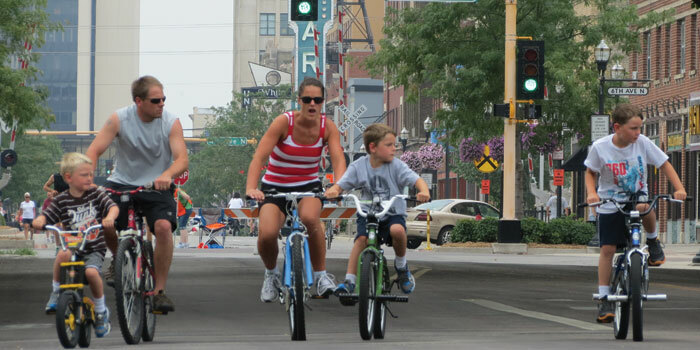 How Does Your State Stack Up on Funding for Walking and Biking?